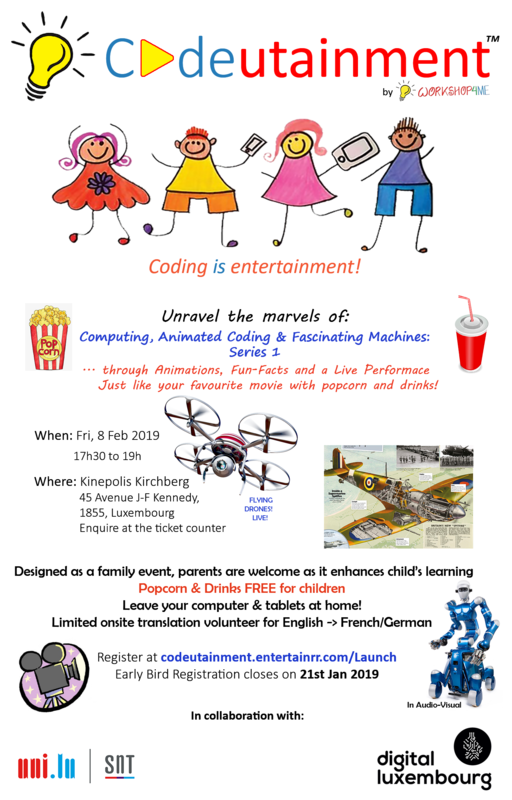 Workshop4Me a.s.b.l is launching an initiative coined Codeutainment – a mix of coding and entertainment, with the support of Digital Luxembourg, Ministère d’État, Grand Duchy of Luxembourg in collaboration with the University of Luxembourg. It is an educational and fun event for children with their families. The objective is to make children understand computer science and its practical applications in an entertaining way. Come and join the launch event! Popcorn and drinks for children – FREE! An evening of Animations, Funfacts and live performance just like your favourite movie with Popcorn and Drinks! Careful of flying drones live! Leave your computers, tablets behind at home! Limited onsite translator volunteer for English to French or German will be available. EARLY BIRD registration closes on 21st January 2019! !